eD@HoMe: 4 lovely covers for today! Good day to you! Here, I have 4 lovely covers to share with you today. 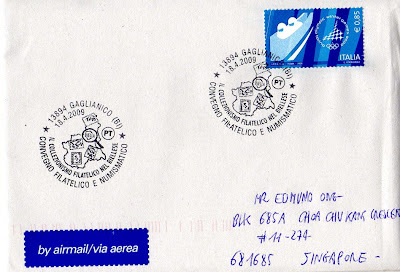 The first cover was sent from Macedonia. It is my first cover from this beautiful country. Thank you, Ana! 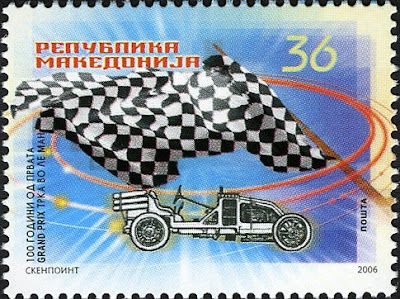 On this cover, you can see a lovely stamp featuring a Renault car of 1906 from the "Centennial of the first Grand Prix Race at Le Mans" series. It was issued on 14 June 2006. 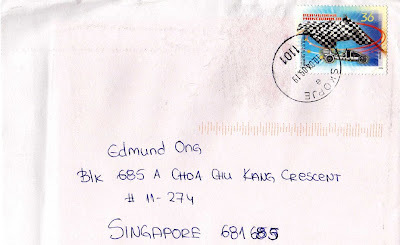 This cover was postmarked in Skopje, Macedonia on 10th April 2009 and reached me on 25th April 2009, having traveled an estimated distance of 9,278kms. Next, we have this awesome cover sent from Italy. Many thanks to Alfredo Guidato! 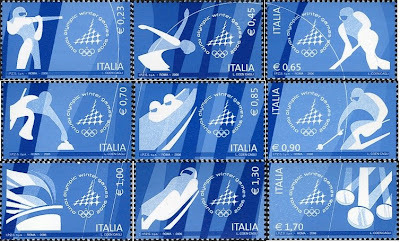 The stamp on this cover is part of a set of 9 stamps from the "XXth Winter Olympic Games Turin 2006" series, issued on 8 February 2006. 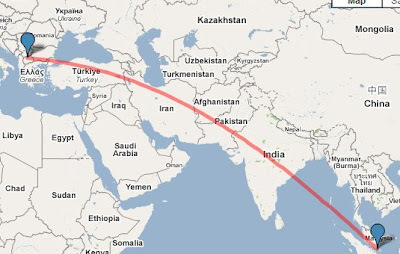 This cover took 8 days to travel an estimated distance of 10,363kms from Chiaverano, Italy. The third cover for the day is sent from Malaysia. Many thanks to Siew Lan! 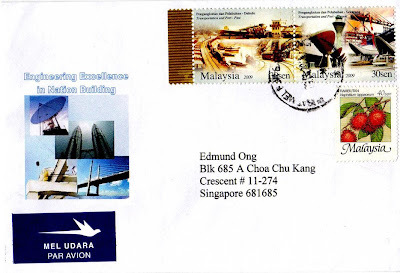 The pair of stamps on the cover belongs to the "Engineering Excellence in Nation Building" series, issued on 20th April 2009. 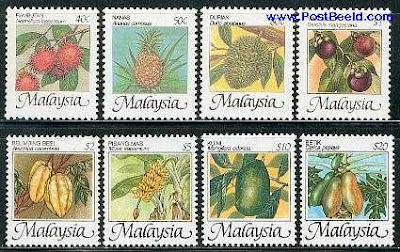 The other stamp on this cover is part of 8 definitive stamps from the “National Fruits” series. It was issued on 5th June 1986. What a gorgeous set of stamps, don't you think so? Last but not least, we have this awesome cover from Poland. This is the second cover that I have received from Kazimierz this week. Thank you very much! On Tuesday, I blogged about a damaged cover that was torn during transit through the post. Kazimierz was shocked to know about it, and he immediately sent me this replacement! Greatly appreciated this earnest gesture, my friend! Thanks again!! 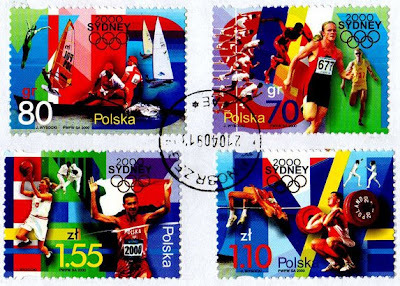 The 4 wonderful stamps on the cover are from the "Sydney Summer Olympic Games" series, issued in 2000. 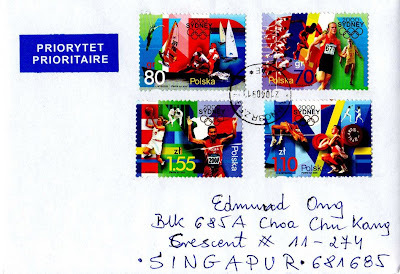 This cover was postmarked on 21 April 2009 and took just 4 days to travel from Tarnobrzeg, Poland. This is the fastest mail that I have ever received from Poland! That's all folks. Have a great weekend! I received both of your cards last week! Thanks a lot! I love them both and i had already featured one of them...THANK YOU!! There is only 1 stamp on the cover. Guess someone in Macedonia must have took the stamp away as you can see the Skopje postmark on the empty slot. I have not receive the postcard yet.